Polyandry provides a reproductive ‘boost’ in Water Skinks! Our new paper on female polyandry in E. quoyii has just been published in Behavioral Ecology. In this paper we tested a series of predictions that assessed the roles of direct and indirect genetic fitness benefits females may receive by mating with many males. Direct fitness benefits are those benefits females gain directly by mating with many males, which increases their lifetime reproductive success. This can include increased help rearing young (as in birds), increased probability of fertilizing ova, or a reduction in costly male harassment, just to name a few. In contrast, indirect genetic benefits are those that affect the survival and reproductive success of a given females offspring. Water skinks are great because we know they don’t have any parental care and we also know that male harassment in this species is not high and females can resist mating with males. This makes the possible direct benefits females may receive more simplistic. We tested predictions from these hypotheses by measuring fecundity of females classified as single and multiple paternity moms. We also measured five surrogates of fitness in offspring from these females [body size and mass at birth, growth rates (captive and wild), sprint speed and endurance]. Indirect genetic benefits models predict that offspring from multiply mating moms would have increased mass, body size, growth rates, sprint speed and endurance. However, our models suggest that offspring from multiply mating moms are not any ‘better’ in the above traits compared with offspring from singly mating moms…So do females receive any benefits from mating with multiple males? It appears that they do indeed, by getting a ‘boost’ in litter size. When we compared multiply mated moms with singly mated moms we found that moms mating multiply produce almost twice the number of offspring! This holds even when controlling for female body size, mass and condition which are strongly related to clutch size in this species. 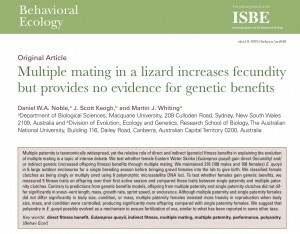 Our results are pretty cool because it suggests that females may be mating multiply, in part, to get either increased quality sperm or increased quantity of sperm and supports the ‘fertility assurance’ hypothesis as a plausible mechanism promoting the evolution of polyandry in water skinks. Interested readers can download and read the paper in more detail HERE or read the abstract below!